With hundreds of paleo almond flour recipes on Elana’s Pantry, I am asked this question everyday. Almond flour is highly nutritious, easy to use and readily available. For those of us watching our glycemic index, almond flour is high in protein, low in carbohydrates, and low in sugars. Unlike other alternatives to wheat flour, almond flour is moist and delicious. After having tested just about every gluten-free flour out there, I can save you a lot of time and hassle when I say that almond flour is far superior to other flours in terms of taste, nutrition, and ease-of-use. NOTE: In all of my almond flour recipes I use blanched (almonds that have had their skin removed) almond flour. I do not recommend using unblanched almond flour. I avoid purchasing almond flour retail at all costs! It is more than $15 per pound in the grocery store. If you purchase it online it is generally less than half of that including shipping. Yes, still expensive, but packed with protein and flavor, so for me, worth the cost. NOTE: One example of almond flour you will find in retail stores is Bob’s Red Mill. This product yields poor, runny results when used in my recipes; compared to other almond flours it has a very coarse texture. I do not recommend using Bob’s Red Mill almond flour in my recipes. I store almond flour in gallon or half-gallon glass mason jars. I keep one jar out in a cabinet and the others in the freezer. Using almond flour straight out of the freezer is an exercise in clumpy frustration, which is why I leave one out. How long does almond flour stay fresh, before it goes bad? I keep mine refrigerated for up to 6 months, sometimes longer. Freezing seems to extend the shelf life even more. 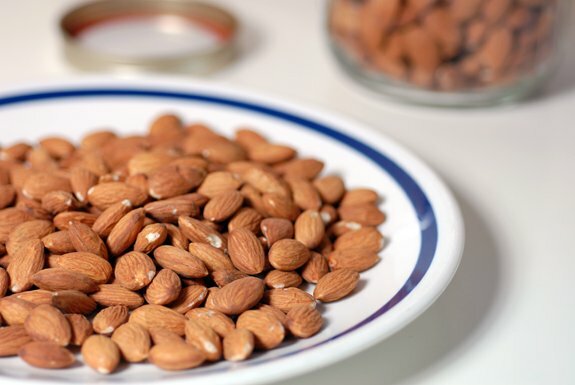 I have a popular tutorial, called How to Roast Almonds, that teaches you how to make your own fresh roasted almonds in under 10 minutes. I have a super easy tutorial called How to Make Almond Milk, that teaches you how to make fresh almond milk from scratch. My readers find it very helpful, and it’s a great way to get more of this healthy nut into your diet! I just used almond meal yesterday that has been in the freezer since 2013 or before since that was the expiry date. My cake was delicious – over 6 years. Gadabout, wow, that might be a record!